The past two weeks have been very busy. 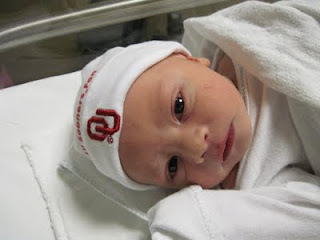 Luke's newest cousin was born on November 5, 2009--just one month and a day after him. My brother, Jeremy, and his wife, Brandy, are new parents to Traber Jackson. He's a cutie, weighing in at 6 lbs, 12 ounces and was 20.5 inches long. It will be so fun for Luke to have a cousin so close in age to him. We get to meet Mr. Traber in just a week and Luke will get to meet all of his other Oklahoma cousins/aunts/uncles then as well. We are very excited to see everyone!! Welcome, Traber Jackson...we can't wait to meet you! Here are two more of Luke's cousins, Brody and Lilly, looking at Traber as he first arrived to the nursery. They bought him this super cute outfit, along with a few others--we just had to put on these overalls and take a picture. We took Luke to church for the first time today. His doctor didn't want him to go until he was 6 weeks old, because of all of the illnesses going around. Due to his size, he said it would be harder for him to fight something if he caught it. Plus, our church has about 1000 people in a gymnasium at each service, so it was probably a good idea to avoid the large crowd during the first few weeks. Here, Drew's parents took a picture of us outside of our house after church. It was a great weekend with Mimi and Papa--we're looking forward to spending time with them again soon.